Manufactured from precision laser cut stainless steel, use of the dpr motorsport shims is a unique engineering solution to ensure highly accurate set-up of toe and camber settings for the rear hubs on De Dion axle Caterhams. 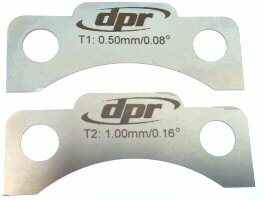 DPR shims have a specific shape to facilitate rapid and reliable set up changes and ensure a consistent fit between the hub and De Dion ear. The DPR shim set (2 off each of 5 shims) should be sufficient for most alignment situations. Our shims have sufficient depth, particularly important for the toe shims, to ensure that these shims will not distort during use. The holes in the toe shims uniquely ensure that these shims remain in their required location without the risk of moving out of position. The tabs on the shims assist rapid at-circuit adjustment and the camber shims can be removed or added without any risk of changing the adjustment for toe. The DPR shim set has different shim thicknesses to enable fine adjustment of rear toe or camber. Two adjustment are provided for toe and three for camber; the shims have recently been upgraded to show the specific adjustment provided by that shim. Our design should ensure that fitment of toe or camber shims will produce the marked change for that shim without the fitment of a toe shim impacting camber or camber fitment impacting toe; thus avoiding wasting time in repeated measurement and shim changes to obtain the required change. 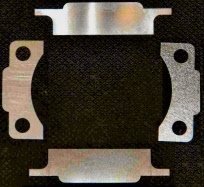 Supplied as a set of two off each shim type & size, a total of 10 shims. Note the above data assumes use of a 13" rim.